C'est magnifique! Mais ce n'est pas la guerre, c'est la folie.note "It's magnificent! But it's not war, it's madness." Sometimes known in Britain as the Russian War. This all started when French Emperor Napoleon III induced the Ottoman Sultan Abdulmecid I to recognize France as the protector of the Christian peoples in Ottoman Palestine (which at the time meant the whole eastern shore of the Mediterranean: not just modern Israel/Palestine, but also Lebanon and bits of Syria and Turkey). This, of course, did not sit well with the Russian Tsar, Nicholas I (not the other Nick), as it had the practical effect of favoring the Catholic communities of the region (particularly the Maronites of Lebanon) over the various Eastern Orthodox communities of which Russia regarded itself as the natural protector. As a result, Russia sent troops to the Ottoman-controlled Danubian Provinces (in today's Romania), forcing Abdulmecid to declare war on Russia. A surprise attack on Turkish ships in the Battle of Sinop drew Britain and France into the war. The Kingdom of Piedmont came in for reasons unclear to everyone but its Prime Minister, Count Cavour. The war was fought on three fronts. The major front was the Danubian Front, fought in the Balkans (mainly Romania); the Black Sea and the Crimean Peninsula are the other two. The name of the war comes from the fact most of the fighting was in the Crimea, particularly in the port city of Sevastopol, which was besieged by the Allies for almost a year before the Russians surrendered. Other fronts were the Caucasus Campaign (fought mainly in Armenia and Northwestern Turkey), with its major battle being a 5-month siege in Kars, and the Naval Campaign (fought in the Baltic and White Seas as well as the Pacific Ocean) which saw the defeat of the Russian Baltic fleet. A major cultural touchstone is the Charge of the Light Brigade during the Battle of Balaclava (25 October 1854). Over six hundred English cavalry, following ambiguous instructions misdelivered, courageously charged a heavily-defended Russian outpost and suffered massive casualties. Tennyson wrote a poem about it. In the end it was an allied victory. The resulting Treaty of Paris (the first since The Napoleonic Wars) gave the Danubian Principality of Moldavia the Budjak, both Moldavia and Wallachia autonomy (to be monitored by the victorious powers; this set off the final chain of events culminating in the official formation of Romania a few years later) and demilitarized the Black Sea (and, unimportantly, the Russian-controlled Åland Islands in Finland). Russia's setback also instituted greater reforms in the military, which would be put to good use when they fought Turkey again 20 years later. 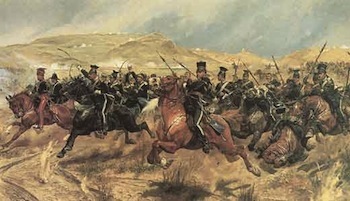 The British military also underwent drastic reforms after their poor performance in this conflict (the aforementioned Light Brigade fiasco in particular having drawn enormous criticism, even if the actual charge was seen as heroic at the time), especially in medicine, sanitation and officer selection. Recent historians (Trevor Royle, Orlando Figes) argue that the Crimean War had farther-reaching impact than is generally thought, even beyond medical and military reforms. The unification of Italy was an indirect result of the Piedmontese Kingdom's participation in the war (see below). The blocking of Russian expansion into Eastern Europe, and waning of Austrian power, left a power vacuum which was ultimately filled by a soon-to-be-unified Germany. Turkish nationalism was also stirred by their role in the conflict. All of these had drastic consequences a few decades later. It was also the first time in the "modern" era that France and Britain cooperated heavily in a military conflict, which was particularly notable as a few decades prior, the two had been at each other's throats as primary belligerents in the greatest war the world had yet known. The earliest seeds of what would eventually become the Allies of the World Wars and later NATO were probably planted in this conflict. In more recent times, the conflict has received renewed interest thanks to a second kind of conflict in Crimea and its environs . Balance of Power: For centuries, Ottoman Turkey and Romanov Russia had been fighting for influence over the Balkans and Ukraine to the West (with Austria and until the late 18th century, Poland) and the Caucasus to the east (with Persia/Iran until the early 19th Century). Beam Me Up, Scotty! : Journalist William Howard Russell never used the phrase "thin red line" to describe the Highlanders at Balaclava. His actual words described "a thin red streak tipped with a line of steel." Demoted to Extra: The British and French contingents to the Allied army were roughly equal at the war's onset, and in the early battles like the Alma and Balaclava, the British did most of the fighting. But the French were better able (or more willing) to replace losses due to battle and illness, so by the war's final battles the British played an ancillary role, at best. Christopher Hibbert claims that by spring of 1855, the French outnumbered British troops by ten to one. Diabolus ex Nihilo: For the Russians, the British attacks on Solovetsky Monastery and Petroplavsk. A full scale world map is the best illustration as to how unconnected and unexpected these strikes seemed. But that's a risk you take when you fight an enemy with absolutely uncontested control of the world's seas and naval bases in every major sea and ocean. Eagle Squadron: the Army of the Piedmontese Kingdom as a whole on this one. They were only fighting the war so they could have a chance to discuss with Britain and France a way to unify the Italian Peninsula. On the Russian side, we had the Bulgarian Legion and the Greek Battalion of Balaklava. A Father to His Men: Admiral Pavel Nakhimov and Sir Colin Campbell. Hold the Line: The Thin Red Line. And from Russia's point of view, the defence of Sevastopol. To make this even more complicated, the siege of Stevastopol tended to be one as well. The Allies had dug in siege lines all around Stevastopol, and the Russians tried to use their superior manpower to try and break through several times only to be defeated every time. So in a way, the entire campaign consisted of both sides Holding The Line against each other, and the campaign ended when the Russian one collapsed. Intrepid Reporter: William Howard Russell is notable in being the first reporter to ever be attached to an army; his reporting revolutionized the practice. Notably, his condemnation of the British logistical system's utter failure in comparison to the French system led to widespread reforms. Lord Error-Prone: Both Lucan and Cardigan were and are criticized for ordering the Charge of the Light Brigade; after the event was over both of them vigorously tried to smear the other. On a larger scale, the incompetence of so many military officers in the British force eventually led to a reform leading to phasing out the practice of purchasing commissions. Not that the British had a monopoly on bad generals, however: Canrobert of the French army was nicknamed "Robert Can't" for his indecisiveness, and Prince Menshikov was downright incompetent, losing the Battle of Alma before being Kicked Upstairs. If there was one commander who bore the ultimate responsibility for the Charge of the Light Brigade, it was the British commander Lord Raglan, who first of all appointed two Lucan and Cardigan in the first place, then issued ambiguously-worded orders, and finally ordered his notoriously hot-tempered ADC Captain Nolan to insist that they be carried out straight away. The combination of Raglan's vagueness, Lucan and Cardigan's mutual antipathy and Nolan's hot temper led to Poor Communication Kills: see below.note The entire episode has been analysed by the psychologist Norman F. Dixon as a classic example of military incompetence. The Medic: Florence Nightingale and Mary Seacole on the British side, Nikolai Pirogov and Dasha Sevastopolskaya on the Russian side. Obnoxious In-Laws: Lords Cardigan and Lucan, Britain's two primary cavalry commanders, were brothers-in-law nursing a long-held grudge against each other. This had dreadful consequences when Lord Raglan appointed Cardigan to serve under Lucan. The Plague: The British and French were scourged by cholera at their initial base in Varna. During a lull in the battle, Lord Raglan wanted the British cavalry to recover artillery captured by the Russians earlier in the day. Raglan didn't realize that due to the undulating landscape, the South Valley where he was to direct the advance wasn't visible across the entire battlefield. Raglan sent several vague orders to Lord Lucan, his cavalry commander, directing him to recover the guns. Lucan couldn't see the South Valley from his vantage point and declined to act. He was further baffled by Raglan's comment that he would "be supported by infantry, which has been ordered to advance on two fronts;" he assumed this meant he shouldn't attack until British infantry arrived.note It's also unclear what infantry Raglan meant. The only infantry on the field was Colin Campbell's 93rd Highlanders, deployed defensively to Raglan's extreme right, and various Turkish units routed in the morning's fighting. The closest substantial infantry force was George Cathcart's division, still several miles away. However, Lucan made no effort to clarify Raglan's instructions. Not understanding Lucan's inaction, Raglan wrote the fateful fourth order, which read: "Lord Raglan wishes the cavalry to advance rapidly to the front, follow the enemy, and try to prevent the enemy from carrying away the guns. Troop of horse artillery may accompany. French cavalry on your left. Immediate." Note the absence of specific reference points for Lucan to follow. Raglan sent his aide, Captain Louis Nolan, to deliver the message, verbally emphasizing that Lucan must attack immediately. Still confused by Raglan's orders, Lucan lost his temper and angrily demanded that Nolan clarify. Nolan responded by gesturing towards the North Valley, where the Russians had positioned several artillery batteries, supported by riflemen and several cavalry squadrons. Lucan passed the order to Lord Cardigan, commanding the Light Brigade. Cardigan initially disbelieved the order, sending aides to Lucan asking for different instructions. Eventually Lucan joined Cardigan and explained that he was to advance down the North Valley. Cardigan protested, but Lucan insisted it was Raglan's order, and the Charge began. As a tragic postscript, Captain Nolan rode with Cardigan and appeared to recognize his mistake as the advance began. However, he was killed by Russian artillery fire before he could alert Cardigan. Royals Who Actually Do Something: The Duke of Cambridge, Queen Victoria's cousin, commanded a British infantry division in the war's early stages. Napoleon III reportedly wanted to take personal command of French forces in the Crimea, but was talked out of it by his generals. Silly Reason for War: The complex background of tensions over Ottoman decline and Russian expansion aside, the war's immediate cause was a dispute over access to the Church of Nativity in the Holy Land between Orthodox and Catholic clergymen. Even at the time, many expressed bafflement that such a trivial issue could trigger an international crisis, let alone a war. Small Reference Pools: Thanks to popular media, pretty much the only things most Westerners recognize from this war are Florence Nightingale and the Charge of the Light Brigade. Never mind that the Charge was only one part of the Battle of Balaclava. Or that Balaclava was a minor skirmish compared to the larger, bloodier and more important battles at the Alma and Inkerman, let alone the protracted Siege of Sevastopol. Or, for that matter, that Russia and Turkey fought major campaigns in the Balkans and the Caucasus without British or French participation. The Siege: Used in Sevastopol and Kars. The Snack Is More Interesting: Sir George Cathcart at Balaclava. Ordered to organize his infantry division as the Russians advanced, Cathcart instead told Lord Raglan's aide to sit down and have breakfast with him. The incredulous aide refused and argued with Cathcart for half an hour until he finally mobilized his troops. Suicide, Not Accident: Widely rumored to happen to Nicolas I when he saw he couldn't win the war. Officially, he died from catching cold, but if this was the case, he made every effort to succumb to it. He also might have poisoned himself. We ARE Struggling Together: Frictions between the British, the French, the Turks, and eventually the Austrians accounted for much of the blundering. This was largely because there was no unified Allied command: Raglan, St. Arnaud and Omar Pasha operated independently, and more or less had to agree to cooperate. Weather of War: The Battle of Inkerman, fought mostly in a compounded fog and rainstorm. More generally, both sides, but especially the Allies, suffered during an extremely harsh winter. What Could Have Been: Had the war dragged on slightly longer, there was a good chance of Austria, Spain, Sweden and even the United States intervening. After Sevastopol's surrender, the main belligerents agreed to negotiate before things spun completely out of control. Xanatos Gambit: Piedmont's participation in the war. The Piedmontese Prime Minister Count Cavour came into the war recognizing that no matter how large or small the commitment, no matter whether they won or lost, the other powers, particularly France, would owe the Kingdom a solid. A few years later, Cavour called in the favour: France must ally with the Kingdom of Piedmont against the Habsburgs and help them take Northern Italy. The ever-honorable Napoleon III couldn't refuse, though considering his relations with Russia this wasn't a terrible burden. He later called in the favour from Britain too: two Royal Navy ships covered Garibaldi's landing in the Kingdom of Two Sicilies, allowing Cavour's plan for conquering the place to start. Zerg Rush: The Russian and, to a lesser extent, Turkish militaries were infamous for this, since unlike the Western parts of the Allies they didn't need to worry about PR or running out of people. It also caused them to suffer more casualties than anyone else. Many works cover the Charge of the Light Brigade,note which isn't an example, inasmuch as a) the attack was made in error and b) the British were heavily outnumbered but the most even more catastrophic Russian attempts to "Bounce" the Western Allies out are left with Leo Tolstoy. The "Sevastopol Sketches", by Leo Tolstoy, who actually fought in the siege. Tolstoy is more famous for much longer works like War and Peace. Flashman at the Charge by George MacDonald Fraser. The Charge of the Light Brigade, 1936 film starring Errol Flynn and very Very Loosely Based on a True Story. A more accurate remake of The Charge of the Light Brigade was released in 1968. The Thursday Next series is set in an Alternate History where the Crimean War continued into the 21st century. In Anti-Ice by Stephen Baxter, the discovery of the titular Phlebotinum results in a sudden and explosive end to the Crimean War. "The Trooper ", one of Iron Maiden's most famous songs, retells the Charge of the Light Brigade from the point of view of one of the British cavalrymen involved. Mentioned in an unusual context in this hilarious post on the discussion board of AlternateHistory.com. The post spoofs the overuse of WWII as a setting for FPS games by inverting it to the Crimean War as the most popular game setting and WWII getting barely any mention at all in games. "Kauan on kärsitty " (Long have we suffered) is a Finnish march that tells about events of this war. The Great Train Robbery(1979) directed by Michael Crichton based on his novel starring Sean Connery and Donald Sutherland. It was based on a real robbery in 1855 Britain of £12,000 worth of gold being shipped by train to finance the Crimean War. Gets a nod in the Star Trek: Deep Space Nine episode "Sacrifice of Angels", when a Starfleet force of 600 ships prepares to attack a Dominion fleet twice their number. Chief O'Brien and Julian Bashir begin quoting Alfred, Lord Tennyson's poem at each other. When an alien crewmember asks for an explanation of the poem, they assure him he'd rather not hear it, given the part Starfleet was about to play. Shaun Hastings: It was also one of the first truly "modern" wars, if large masses of men shooting each other over which toff got to call themselves Emperor of Wherever can be called "modern." Technology like the exploding artillery shell, the railroad, and the telegraph shaped the conflict, and the advent of photographic technology meant it was one of the first wars to be documented in the press. This was particularly delightful in that the great legacy of the Crimean war was the rank incompetence and general mismanagement on the part of the leadership of all sides. Something to really be proud of there. If you're going to be inept, be REALLY inept. For the citizens on the home front puffed up with patriotic fervour, this was a bit like going to see your favourite band in concert only to realise that they only sounded good thanks to auto-tune and ruthless editing. A Bride's Story is set against this backdrop in Central Asia.